Former NAACP President Benjamin Todd Jealous, also former Black press executive, is now launching a political career. Perhaps recently best known as a surrogate for Democratic presidential candidate Sen. Bernie Sanders, Jealous confirmed this week that he is running for governor of Maryland. He cited his long record of civil rights and the diversity of the state of Maryland as being matched to his favor. Jealous is entering a crowded field of seven other candidates for the Democratic primary to be held June 26, 2018. He believes disaffection for the scandal-laden Trump administration may cause voters to lean back toward Democratic leadership after electing Republican Gov. Larry Hogan in November 2014. Hogan is eligible to run for re-election in the state where the Democratic base is actually two to one. “Larry Hogan is governor of Maryland because in 2014, we had a high tide of Republican turnout and an ebb tide of Democratic turnout,” Jealous said. He pointed out that Hogan won by 60,000 votes after 125,000 Democrats who had voted in 2010 didn’t show up to vote in 2014. The election will be held Nov. 6, 2018. But first Jealous must distinguish himself among the crowded Democratic field. In that regard, he may just have a not-so-secret weapon. If he can win an endorsement from Sen. Bernie Sanders, it may bolster his chances significantly. “Let’s just see,” was Jealous’ only response when asked whether he expects to receive Sanders’ endorsement. Sanders won 36 percent of the vote in Maryland’s Democratic presidential primary. 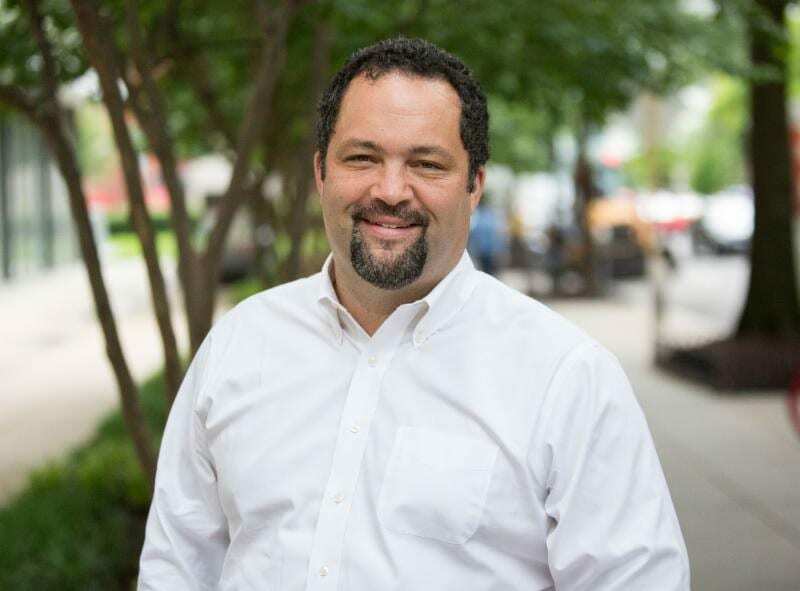 If Jealous can win a majority of those voters; plus a significant portion of Maryland’s 45 percent Black vote, he is a strong contender to win the Democratic nomination. But the key will be to excite the Democratic base to the polls. Jealous believes he has the record to do just that. Maryland has a 45 percent White constituency and 10 percent that encompasses other races. Jealous believes his background and civil rights record could attract a following similar to the “Rainbow Coalition” that was amassed during the Jesse Jackson presidential campaign, for which Jealous also worked in 1988. Jealous was born in Pacific Grove, Calif. But his parents, a mixed-race couple, had met in Baltimore where his mother grew up. His father, Fred Jealous, who was White, helped integrate lunch counters in the South. His mother, Ann Jealous, worked with the Student Nonviolent Coordinating Committee in the 1960s. As a teenager, Jealous became steeped in civil and voting rights work and spent summers in Baltimore with his maternal grandparents. “The combination of an activist rooted in the tradition of the NAACP and the civil rights movement and an activist rooted in the Bernie camp, gives us a broad base that looks like Maryland similar to what you saw of Doug Wilder in Virginia after the Jesse Jackson campaign,” Jealous said. Jealous’ career has been woven with civil rights and politics. Between 2000-2004 he served as executive director of the National Newspaper Publishers Association (NNPA). Earlier in his career, he’d worked as an editor for the historic Jackson Advocate newspaper in Mississippi. After NNPA, he became founding director of Amnesty International’s U. S. Human Rights Program. In 2008, he became the historically youngest NAACP president at the age of 35, an office he held until 2012. He later became a venture capitalist with the Oakland, Calif.-based Kapor Center for Social Impact. He also played integral rolls in the presidential races of President Barack Obama. If he wins, Jealous would become the nation’s fourth Black governor in modern history. The others were Virginia’s Gov. L. Douglas Wilder, elected in 1989; Massachusetts’ Gov. Deval Patrick, elected in 2006 and re-elected in 2010; and New York’s Gov. David Paterson who served two years after the resignation of Gov. Eliot Spitzer in 2008. Jealous, 44, has two young children to whom he often refers when expressing concerns about the future of Maryland. Reflecting on the economic deprivation that became a national spotlight during the Freddie Gray case, he accuses Hogan of having ignored Baltimore during his tenure. Ultimately, the voters of Maryland must be inspired enough to believe the election even matters.